Trade and customs expert Eva Chan Chaw Peng is scheduled to deliver a profound speech at the Chartered Institute of Logistics and Transport (CILT) ‘International Conference 2018’ to be held on 19 September at the Balmoral Hall of the Kingsbury Hotel, Colombo. The theme for the conference is ‘Staying Relevant in a Digitally Connected Future’. Since 1993, Eva Chan has accumulated a long experience in Single Window and Customs implementation. She has worked as a domain expert in the trade and Customs sector in close cooperation with various international organisations. 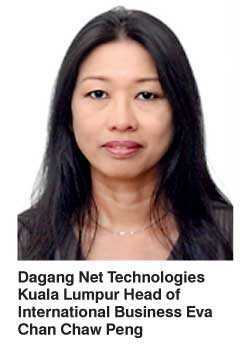 She has represented Malaysian Government as the technical consultant in ASEAN Single Window Technical Working Group. Eva Chan’s involvement in international projects which are focused on Single Window feasibility spreads across countries such as Nigeria, Nepal, Hong Kong SAR while nourishing her role as a WCO Data harmonisation expert. Including Sweden, she has carried out data harmonisation between Customs and OGAs for ASEAN Single Window for several countries all over the world. She was appointed as the Head of DFTZ Platform by MDEC to implement the world’s first DFTZ Platform that enabled the connection of eMarketplaces such as Alibaba to Malaysian Customs and Other Government Agencies from August to December 2017. She later rejoined Dagang Net as the Head of International Business which looks into expanding Dagang Net’s international connectivity and implementing a Single Window System worldwide which is currently engaged in establishing Single Window connectivity between Malaysia and China. With a global membership of over 33,000 from 32 countries across the globe, CILT provides a professional identity to those in the ever expanding logistics and transport sector. It is a strong, active and a unified professional association that is able to speak with authority on strategic issues affecting businesses and people in the industry and support their careers.